This is a guest post written by Sam, my old assistant. 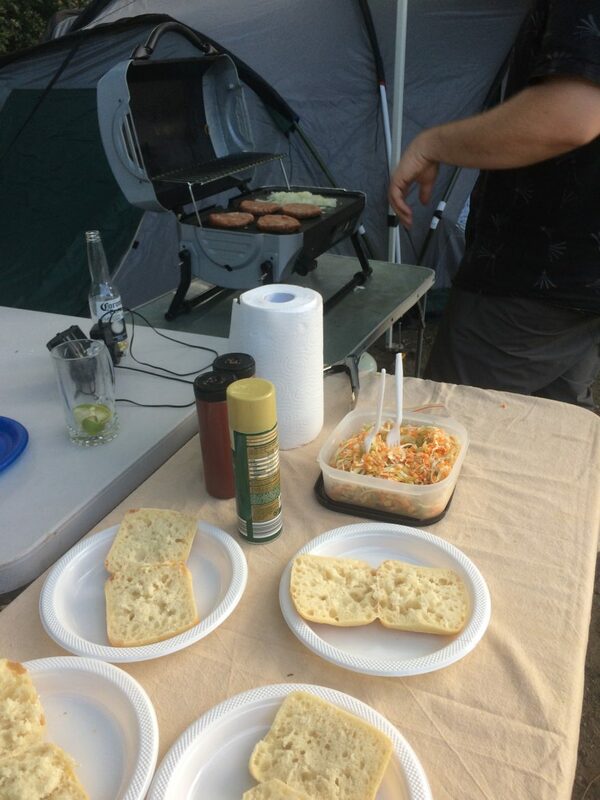 We have been on quite a few camping trips over the years, and have gone from being minimalists to collecting all sorts of camping stuff and taking luxury items with us to be as comfortable as possible. Having everything on hand also saves us a lot of time. We no longer waste time hunting down local shops and specialty stores, which is great because we can truly relax and enjoy the camping experience to its full glory. 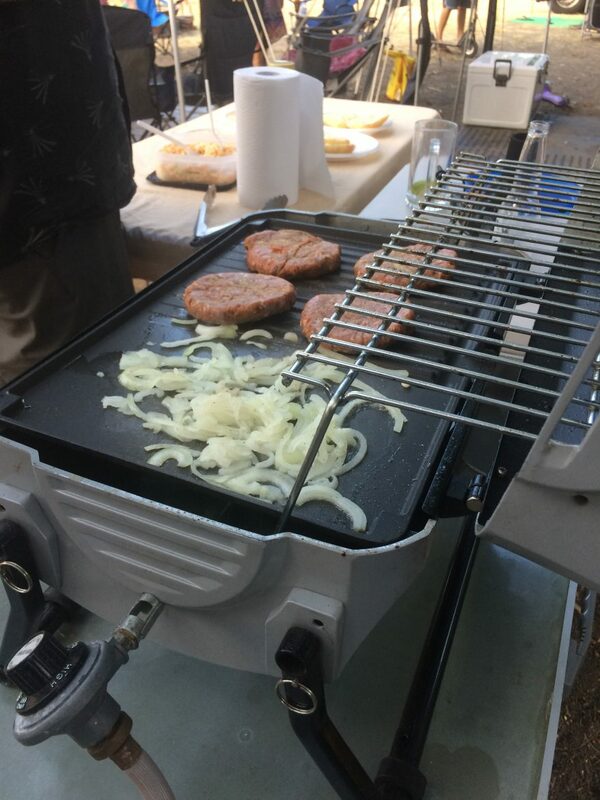 I think that camping is so special, because when you camp in a caravan park, the atmosphere is completely different to the usual hotel or resort where you go through the lift straight to your room. There’s just something about the great outdoors that puts a great big smile on my face. It brings you back to basics and you enjoy nature so much more. When we’re out camping, we get to meet people as they stroll through the park, the kids make friends while playing and everyone gets to relax and enjoy the outdoors. 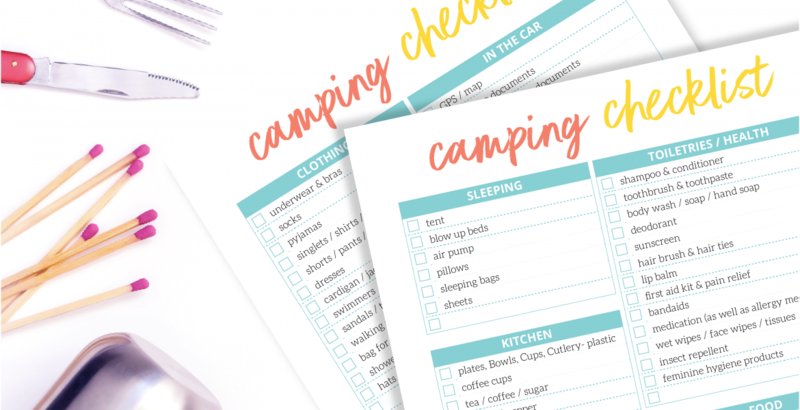 But it’s important to always have a camping checklist to follow, to make your holiday more pleasurable. 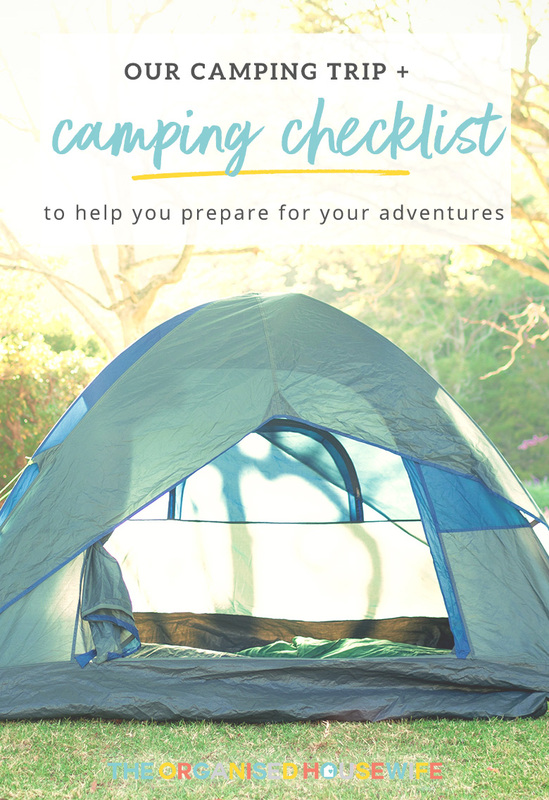 My Camping Checklist can be downloaded here. It contains items from the basics to a few extras that may not be necessary, but add to the comfort of your stay, so it will help you make sure that you don’t forget anything. 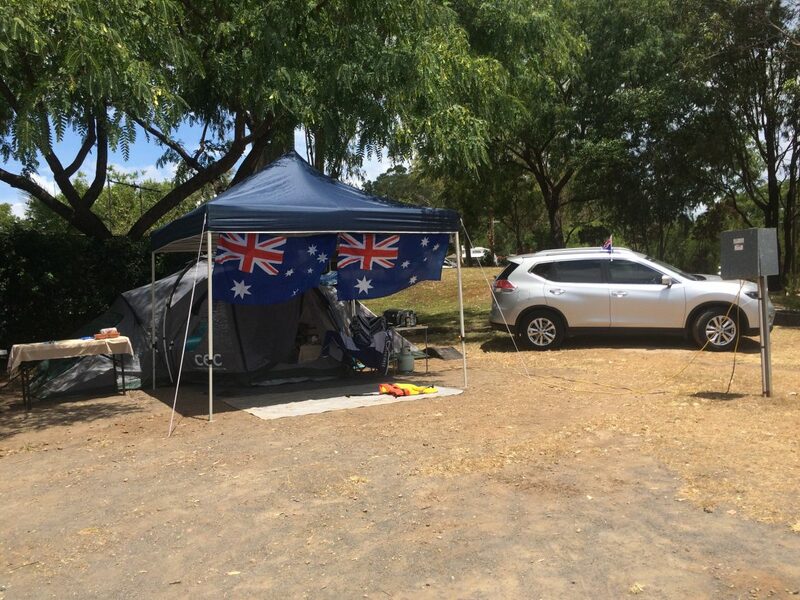 Our most recent camping trip was on Australia Day with some friends. 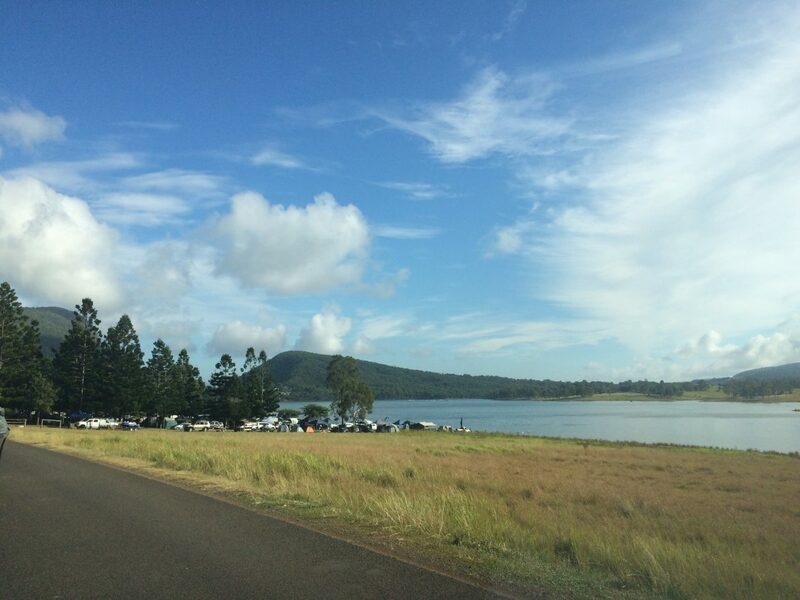 It was just over an hour’s drive to get there, with us taking the scenic route to enjoy some breathtaking views. 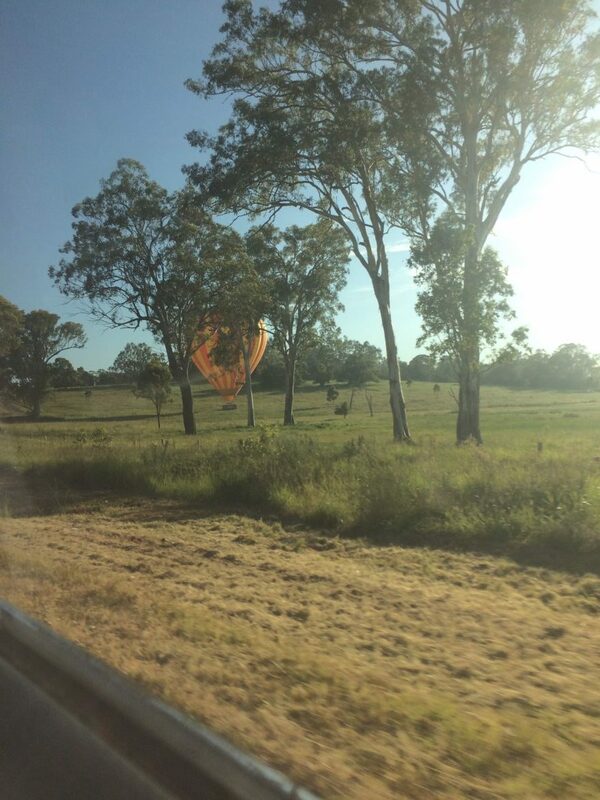 On the way down, we saw a giant air balloon. My son was so excited to see it that he grabbed the phone from me to take a photo. We also came across some corn fields, with the most beautiful landscaped mountains as we drove closer to our campgrounds. Our tent was a second-hand online purchase and it has been one of the best things we have ever got. It’s awesome and includes 3 rooms that could be closed off with a small attachment. 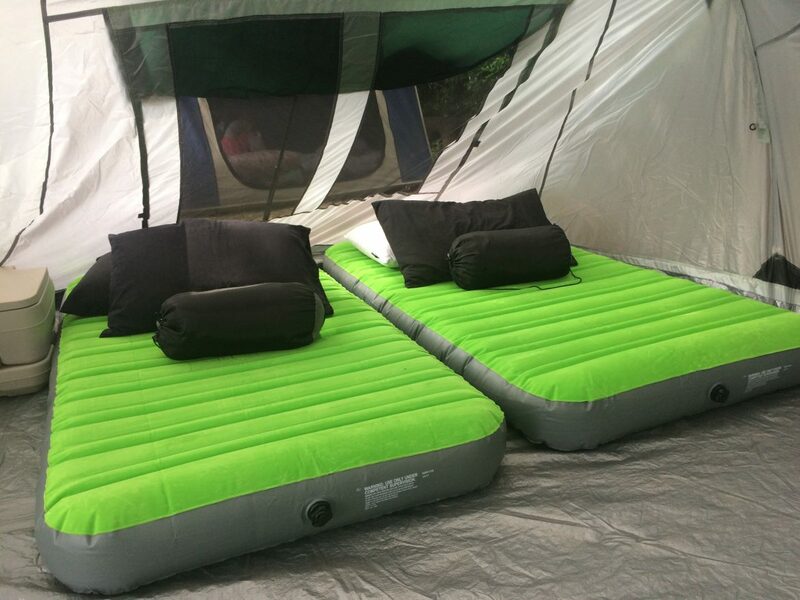 They fit a king single airbed, which the kids loved as they could set up their own little space with their clothes, beds and personal items that they could close off as their own space for the weekend. The floor plan was so big, it was a welcome sight compared to our previous tent. We had a camp shelf for food, a table with the kettle, power point and torches set up and other items like the esky and chairs inside the tent at night for safe keeping. My husband is much larger than me as I’m quite petite, and we find sleeping on a double airbed together super uncomfortable. We end up rolling into each other, or one sleeping low to the ground while the other up high. So, we opted for two king single air mattresses side by side, and it was actually really comfortable with both of us getting a great night sleep. Camping is so much fun when you camp with good friends! 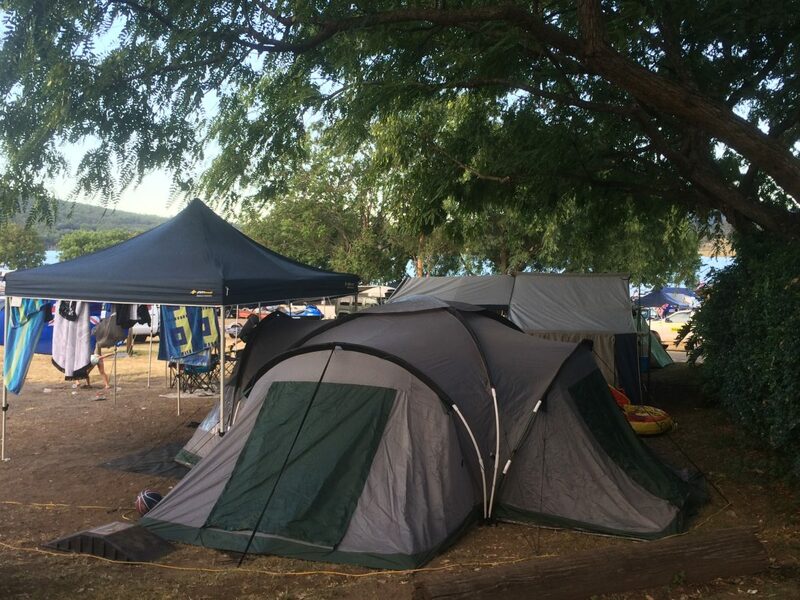 We had the perfect spot under the shade of the trees and 3 tents in a row with a communal area out the front as shown here. It was actually a great set up between three families and everyone had a blast. This was or home away from home for the 3 days we were away. Our car was parked close by and held our suitcases, towels and toiletries for convenience. It was easy to access each day before we’d head for the showers and it gave us extra tent room by having these items in the boot of the car. We planned our meals by proportion to save space in the car fridge and esky as best as we could, and we even pre-chopped the onions, and had them in a zip bag and froze them to save time. We had the perfect amount of Kat’s Homemade Coleslaw that we were able to eat on our hamburgers, in ham sandwiches for lunch and again as a side dish with some steak on the second night. 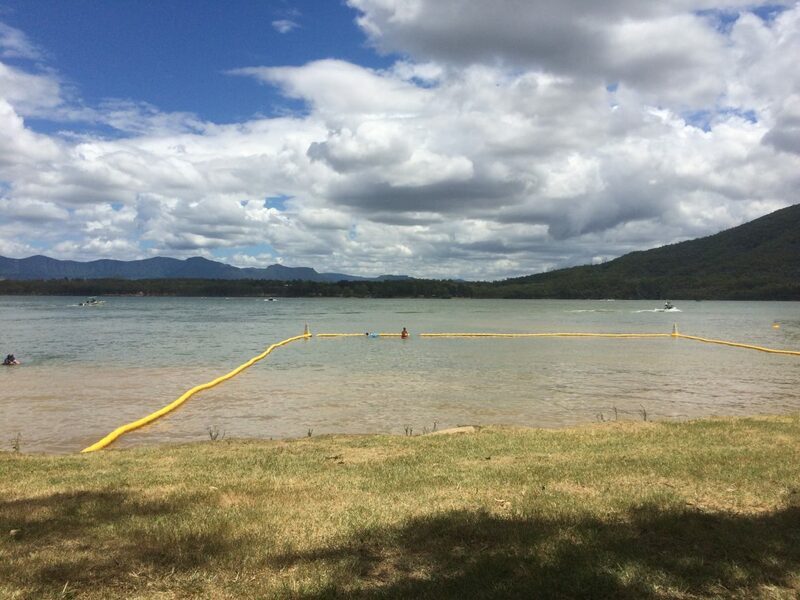 The Caravan park we stayed at had a fenced off area that was just perfect, as there were so many boats and jet skies that would pull up while we were sitting in the water to cool off. We were super excited when we spotted this hiding around the other side of the lake. The evenings weren’t too cold, but who could pass up an opportunity to have a little campfire? 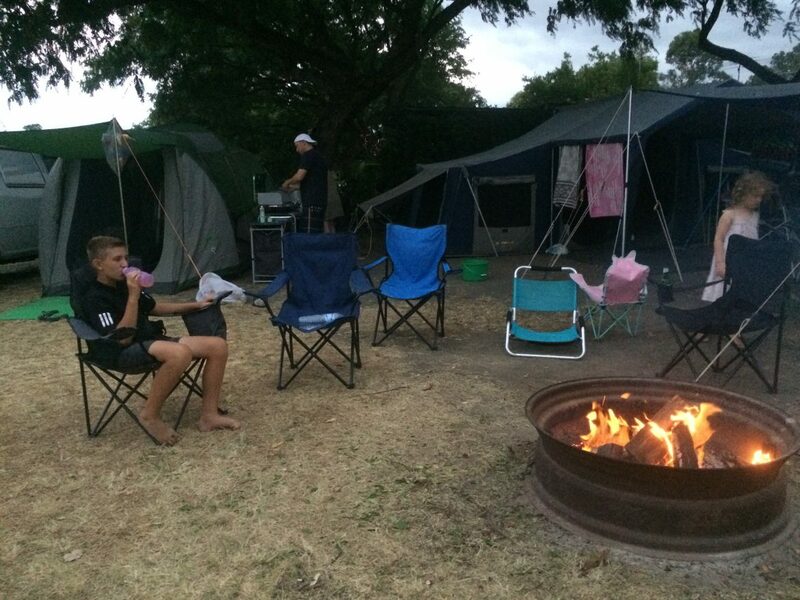 Lucky for us the caravan park had fire pits and sold firewood & marshmallows. We also walked around the park and managed to find some of our own firewood and got a little fire going, which all the kids loved. If you have’t tried marshmallows cooked over the open fire, it’s a must! They are delicious and melt in your mouth. Check out this beautiful view. We went for a night walk and saw an incredible sunset over the lake. 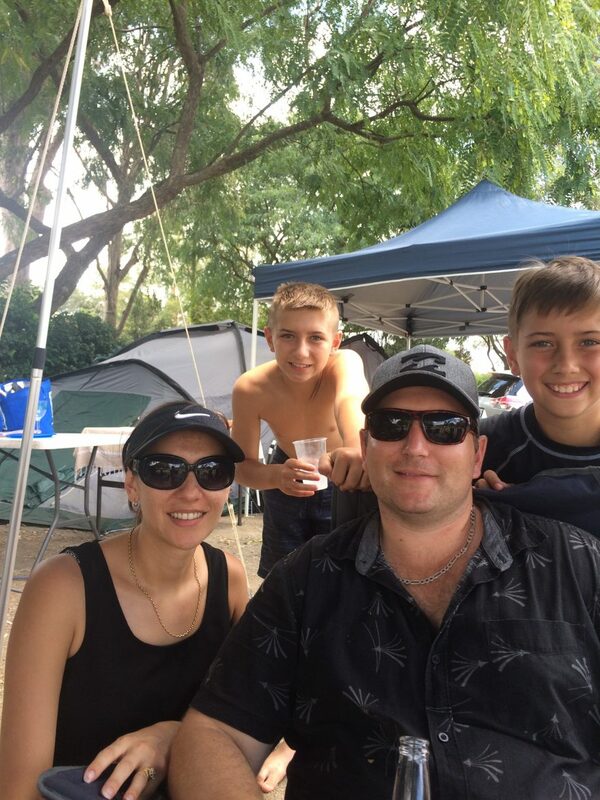 Camping with my family is a great time to get together to play some cricket, go for walks, swims and simply sit around and have a chat. Our kids are at a great age that they were happy to sit and chat and help out with the set-up and also help with the packing up. It was a really great trip to get away from the busyness of normal life for a few days. Clothes- Pj’s, jumper, swimmers, day clothes x however many days you’ll be there, night time outfit, underwear, socks, thongs, shoes, shower shoes, shower mat- to stand on in the bathrooms while getting dry. Some Caravan parks will have a communal area with a BBQ, Kettle, Fridge etc although we like to take all of our own and found a plastic kettle for just $10 that fits in with our camping gear easily. Often you’ll find you may be able to have a contained wood fire, this is so much fun if you have some marshmallows on a stick over the fire. What’s your favourite thing about camping and where is your favourite place to go?